Today, 8 February, marks the fourth International Day of Women and Girls in Science, to recognise the critical role women and girls play in science and technology across the UK. A United Nations led day, it looks to celebrate the achievements of women and girls in science, as well as inspire girls to take up Science, Technology, Engineering and Maths (STEM) subjects at school. 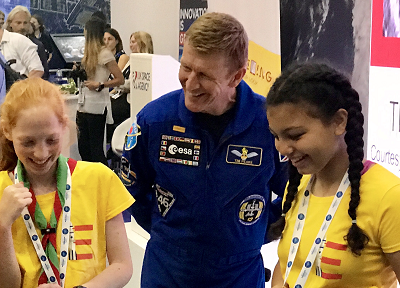 Amongst the UK’s Aerospace, Defence, Security and Space sectors, the industries have been continuously encouraging women and girls to take up STEM subjects and be inspired to have jobs in engineering. The Women in Aerospace and Aviation Charter launched at the 2018 Farnborough Airshow is just one initiative that our sectors have taken to have a fair and balanced workforce that is accessible to all. In the UK, it’s no secret that women and girls remain underrepresented in science and engineering, with just 8 per cent of women taking up STEM apprenticeships. The participation gap in STEM subjects starts from the school age and occurs for a number of reasons including societal and cultural barriers, but also not having enough women in STEM roles to be role-models to girls and to show that science and technology can be open to anyone. There is a growing demand for STEM skills, particularly for sectors such as engineering and manufacturing and it is essential that gender doesn’t act as a barrier preventing young women taking STEM subjects, after all, women are good for business. The UK has made a number of positive steps to address the gender gap in STEM and industry is working hard to be at the forefront of the campaign to inspire women and girls. Just last week, the name of the British built Mars rover was revealed to be Rosalind Franklin, named after the UK scientist and co-discoverer of the structure of DNA. “It is a tremendously fitting tribute that the rover has been named after Rosalind Franklin as she helped us understand life on Earth and now her namesake will do the same on Mars. It’s great to see the Government working in collaboration with industry to inspire the next generation of engineers and ensure that women and girls don’t feel shut out from careers in engineering and manufacturing. Read more from ADS on Women in Engineering here. This is an informal blog written by ADS staff. While it is written from an ADS perspective, contributions should not be taken as formal statements of ADS policy, unless stated otherwise.